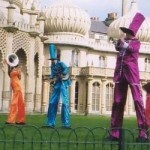 Musical stilt walkers never fail to amaze crowds at events, festivals and parties. 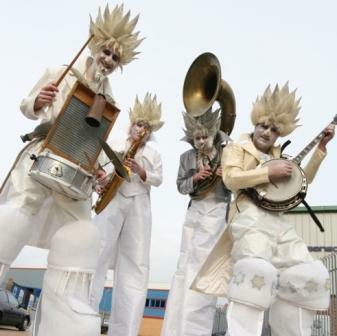 These high flying musicians can appear in a number of guises such as: The Victorian Spectres Brass Quartet, 1920s Jazzers, Rock Devils, Jack Frosts, Insects, Scurvy Sea Dogs, Punch and Judy, or as a group of Medieval Minstrels. 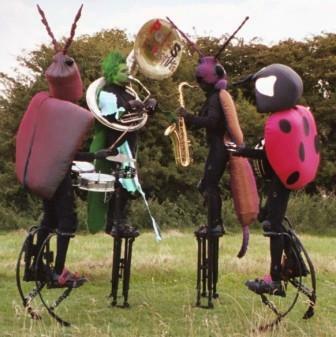 They have strutted their long legged stuff across an array of arenas which include Glastonbury, Victorious and Wembley Stadium. These highly skilled stilt walkers can be found performing around the south of England, mostly within Hampshire, Dorset, East Sussex, West Sussex, Surrey, Kent and London. However performances overseas are also considered.